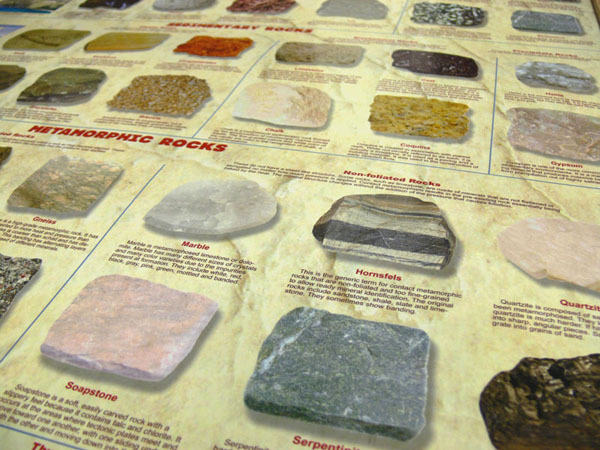 The same high quality as our Mineral poster, our Rocks poster is a must-have for anyone interested in rocks, minerals or geology. A very useful colorful & beautiful poster. 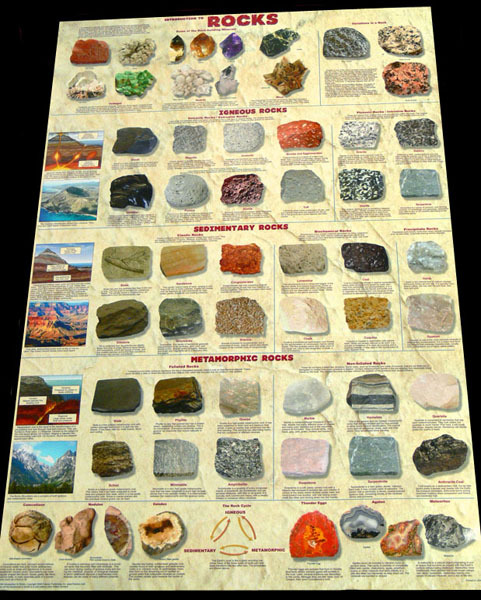 The poster is a great rock identification chart. The introduction explains that each type of rock is the result of a specific mixture of minerals subjected to a clearly defined geological process. It shows and describes the most common rock-forming minerals and variations that occur with rock types. The bulk of the poster is divided into three sections, one for each rock type: igneous, sedimentary and metamorphic. An illustration shows how they are made and a photograph shows a natural formation. A dozen other photographs show representative specimens. Each is accompanied by a caption citing identifying characteristics and common variations. A bonus section shows and explains some of the more specialized and popular rock forms, such as geodes, concretions, agates and meteorites. This is a great poster for earth science classes and is especially useful to collectors. The 24" x 36" poster is sealed in a heavy crystal clear plastic laminate making it waterproof and very resistant to damage.